When it comes to tailgating, the more festive the occasion, the better. But after food, drinks and gameday tickets—or Pay-per-View costs, if you’re an at-home tailgater—who has room in their budget for officially licensed party decor? So, you’re in luck. 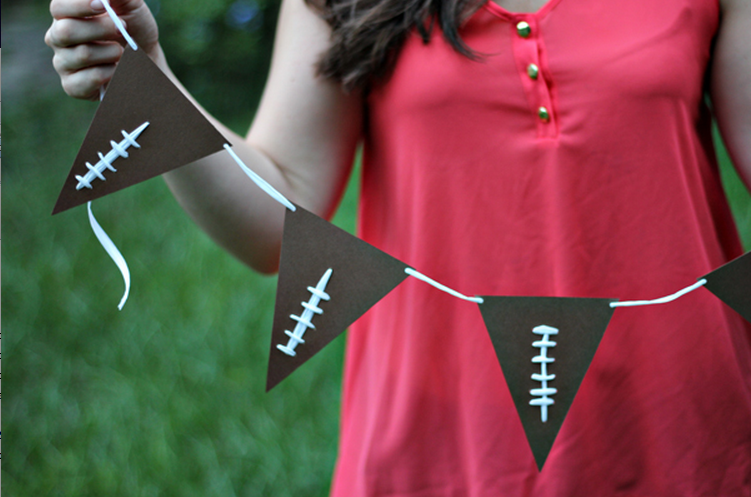 We’ve rounded up 14 DIY tailgate party decor ideas from bloggers to help you support your team and stick to your entertainment budget. If your tailgates are more like blowouts than casual get togethers, consider making this referee-striped background for a photo booth, plus the accompanying football props. The football-esque lacing on this cute garland is created by “sewing” ribbon directly onto the paper pennant. Who says food can’t act as decoration too? For this sporty twist on traditional chocolate-covered strawberries, use a Ziploc (or frosting bag, if you have one) to create the lacing. If you need a festive way to showcase those strawberries—and the rest of your gameday snacks—try this DIY mini bleachers project for the perfect presentation. The foam finger is the definitive tailgate accessory for fans everywhere, but buying the official version will set you back significantly, so make your own instead (note: the pattern is kid-sized). This project is a little more intensive, and you’ll need a woodburning tool on hand, but the result is a professional-looking cork trivet that will last for seasons to come—and makes for an awesome DIY gift, by the way. 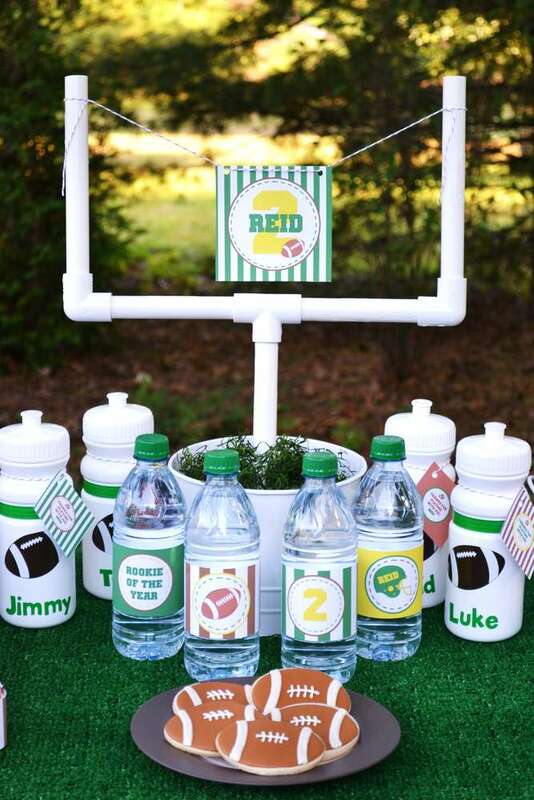 A miniature goalpost made from PVC pipe is the perfect centerpiece for your tailgating table—and it can easily be recruited for a game of tabletop football during halftime. This simple DIY will last you all season and pinch hit as Super Bowl decoration too, since it’s football-themed rather than team-specific. This handmade signs looks good enough to be store-bought, but it’s actually quite cheap to make, as the “stain” is soy sauce and the “paint” is from Sharpies. Bring the field to your drinks with this surprising spin on the classic coozie. Pick up a mat of artificial grass at your local hardware store and get to hot glueing. Speaking of drinks, you’ll need a way to keep those beers and sodas cold when they’re on the bench, so dress up a traditional galvanized beverage tub with these easy DIY. Declare your team allegiance with this rustic door hanger. Just be careful not to let the paint bleed beyond the stencil, or it will end up looking messy instead of classy. Not only is this adorable blanket soft and warm, it doubles as gameday decor when thrown over the back of a couch or chair. The tutorial even includes a free pattern! For more tailgating ideas, check out our 12 Tips for Tailgating on a Budget and this roundup of cheap tailgating snack recipes.